One year ago, eldritch horrors of cosmic malevolence called the Iconnu attempted to destroy our reality. They failed, but the attempt left the world in rapidly darkening shadow. Dead souls returned to claim living bodies, creating blood-drinking undead fiends: vampires. Bestial spirits came as well, to create werewolves, and demons formed bodies from worldly matter. Magic crashed back into the world, and mages wield its power for whatever purpose suits them. Humans called the Awakened unknowingly keep the darkness at bay. These supernatural creatures struggle against each other and clash in the shadows, most attempting to destroy the world, but a few fighting to preserve it. And over it all, the Iconnu still lurk, squeezing the world like an eggshell. – Characters play as vampires, mages, werewolves, demons or Awakened and wield frightening supernatural powers against their own kind. – The world is the one we know, but now much darker: destruction in the central United States, nightmares coming to life and beasts roaming shattered cityscapes. – This game uses a variation of the most popular roleplaying game system in the world. 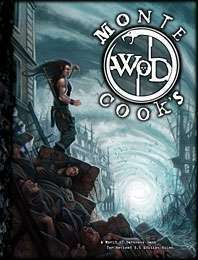 Monte Cook’s World of Darkness is now available in eBook, softcover and hardcover editions at DriveThruRPG.com. ← Adamant GM Sale and Far West Contest!